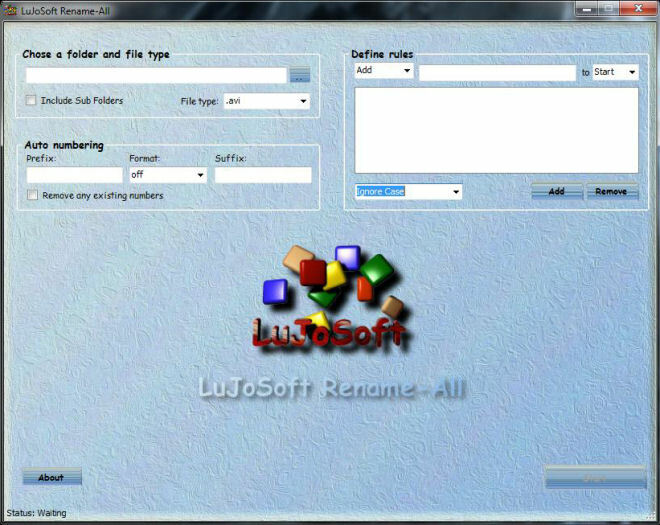 LuJoSoft Rename-All is program that can help you with the tedious task of renaming large numbers of files. The program can be used by anyone who needs to keep large collections of files organized (such as mp3 files, image and graphics files, web-site-related files, system files). You can add text to filenames. You can remove any text in the filenames. You can replace any text with any other text you want. You can use all lowercase, uppercase or capitalize each word. You can auto number in different format. You can use prefix or suffix. You can remove all existing numbers. You will preview the change before applying it. In case of mistake there is a undo button. At all time you can abort or cancel. it's absoutly Free!!! No catch, no nag screen or cripple function. Select a folder containing the files to renames. Define the rule of renaming, you can have up to 20 rules. Enter a format for auto numbering if needed. Should work on any windows version tested only on 32bit OS. Then enjoy! Another release without no catch, no nag screen or cripple function.